Thirty seven ILWS members and guests attended a special morning tea on Tuesday December 4 to congratulate Associate Prof Rosemary Black on the release of the book Sustainable Tourism & The Millennium Development Goals: Effecting Positive Change; Dr Black is co-editor of the book which was launched in the U.S. at the global sustainable tourism conference in September. Rosemary described her time as an adventure travel guide working in Nepal 20 years ago as the foundation to her career working at the University lecturing in Ecotourism. During her guiding years she worked with co-editor Dr. Kelly Bricker who was also a guide at that time, and embraced the opportunity to collaborate on the book when they worked together at the University of Utah when Rosemary was on study leave. "There are many ways sustainable tourism can make a big difference to local communities" said Rosemary,"choosing locally owned accommodation options, hiring local guides, being just a few". In describing some of the case studies in the book Rosemary said "There are some great success stories, including the 3 Sisters Adventure Trekking Company, a tour guide company in Nepal, run by 3 sisters who operate trekking tours for women and their business supports the empowerment of local women by giving them tourism and business skills as well as increasing their confidence and economic independence." Nearly fifty people, including representatives from the Commonwealth Environmental Water Office (CEWO) and various partner agencies, attended a special morning tea and presentation held on Tuesday, November 20 to celebrate the continued success of two exciting projects in the Murray-Darling Basin for the Institute's Sustainable Water Strategic Research Area. Both projects are funded by CEWO and will monitor and assess the ecological responses to environmental watering in the Edward-Wakool and Murrumbidgee river systems during the 2012-2013 water year. Partners in the Edward-Wakool project, led by A/Prof Robyn Watts are the NSW Department of Primary Industries, Murray Catchment Management Authority, Monash University, the NSW Office of Environment and Heritage and the Wakool River Association. Partners in the Murrumbidgee project, led by Dr Skye Wassens, are the NSW Department of Primary Industries, the Murrumbidgee Catchment Management Authority, the NSW Office of Environment and Heritage, and the University of NSW. Both A/Prof Watts and Dr Wassens gave presentations on previous work done in the two river systems and on the current monitoring projects. As well as the projects in the Edward-Wakool and the Murrumbidgee, CEWO is also funding similar monitoring projects in the Goulburn-Broken river system and Lower Murray. A lunchtime presentation by visitor to ILWS, Dr Phousavanh Phouvin, a researcher from the National University of Lao, to about 20 people on Thursday 15 November at the Albury-Wodonga Campus included a broad overview of the challenges faced by fish in the Lower Mekong Basin. Dr Phouvin, who has been based at the Narrandera Fisheries Centre for the past three months, spoke on his research into aspects of hydro plant design that cause fish injuries and mortality. 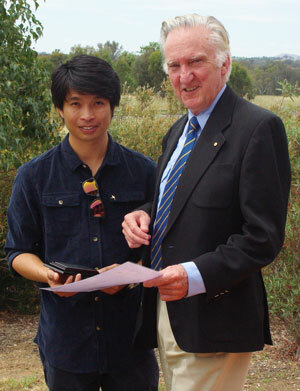 Dr Phouvin's work is closely linked with a current collaborative project between ILWS and Narrandera Fisheries Centre. After his presentation, Dr Phouvin was presented with a Crawford Fund Fellowship Award for early to mid-career researchers by the Crawford Fund's Chief Executive, Dr Denis Blight, AO. Dr Blight said Dr Phouvin was the first researcher in the fisheries science field to receive the award. "I am struck by the similarity of issues faced by Laos and the Murray Darling Basin, and hence the potential for cooperation and collaborative research," he said. Neil spoke about about some of the current challenges and successes in Indigenous engagement in the Murray-Darling Basin and his view of how we can help 'close the gap' with Indigenous Australians. His presentation provided insights into how Indigenous people are having their views heard in the current Basin Planning process and what influences they have had on the Basin Plan. 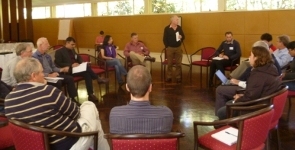 A symposium called "Environmental Justice and Governance: Strategies for building environmentally sustainable and socially just communities" was held in Wagga Wagga, November 8 to launch the Institute's new Environmental Justice and Governance for Change Strategic Research Area. The new SRA has evolved from the former Innovative Perspectives on Energy and Climate Change SRA. The symposium, which was attended by 22 people, featured guest speaker Prof Stewart Lockie, a preeminent rural social scientist from the Australian National University who heads its School of Sociology. Stewart (who did his undergraduate studies at CSU)spoke on a number of topics designed to stimulate ideas/discussions related to some of the issues around environmental justice and governance. They included how rural and farming communities are now much more impacted upon by globalization compared to 20 years ago; global megatrends that will change the way we live; resource use and economic growth; Australians' views on climate change; the Anthropocene (a geologic term used to describe the impact of human activities on the Earth's ecosystems); and how people pull together in natural disasters and how that behaviour changes with technological or drawn-out disasters. Dr Paul Humphries presented " Making the dead speak: how historical ecology can aid freshwater conservation and management." to 45 people on Thursday Novermber 1. Although it goes without saying that knowledge of ecological condition, patterns and processes is essential for effective conservation and management of freshwater ecosystems, this knowledge is difficult to acquire or at least difficult to acquire at relevant time scales. This is because: (a) most ecological studies are carried out over periods far too short to get a good understanding of the dynamics of communities, assemblages, species, populations or even individuals, let alone how these interact with environmental conditions; (b) the environment is in its current state because of everything that has come before, and influences or disturbances may not be obvious or have disappeared; we are, in effect, seeing the ghost of disturbances past; (c) we are often unwittingly seduced into thinking that the environmental conditions which prevailed when we were young or at the start of our careers are some kind of baseline towards which we should be heading; and (d) the past is all we have to predict the future, so without an appreciation of past conditions and relationships, we may make bad conservation and management decisions. This seminar argued for the use of historical ecology in aiding conservation and management of freshwater ecosystems. Paul's talk presented some ideas, approaches and research, mostly relating to fish in lowland rivers of the Murray-Darling Basin. 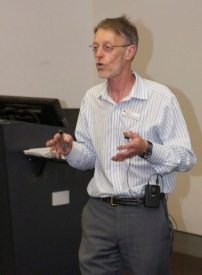 Food Security in Australia: Challenges and Prospects for the Future one day forum was attended by over 50 people on Tuesday October 30 at the Albury-Wodonga Campus of CSU. The events of the day included the launch of the book "Food Security in Australia: Challenges and Prospects for the Future edited by Quentin Farmar-Bowers, of Deakin University and ILWS researchers Dr Joanne Millar and A/Prof Vaughan Higgins. The key note address was delivered by Cathy McGowan AO, well known rural consultant in agriculture and rural development and a live broadcast by the ABC country hour with Libby Price. The presentations were given by guest speakers from CSIRO, University of Melbourne, University of Tasmania, Charles Sturt University and the Albury Wodonga Regional Food Security Network. The talks were well received with many questions and a lively discussion took place after lunch on two key topics 1) education and engagement in food literacy, and strategies for using the political agenda on food security to promote further research and action. Free Preview of the ebook version link found here: http://www.springer.com/food+science/book/978-1-4614-4483-1. The seventh in the Murray-Darling Seminar Series, held on Thursday, October 24 at CSU's Albury-Wodonga campus, drew a crowd of around 30 people including a good contingent from the Murray CMA's Deniliquin office, who were in town for a training program. The seminar was presented by the Murray CMA's Anthony (Rex) Conallin, Catchment officer-Water, who gave an interesting and thought-provoking presentation based on a case study for his PhD research which examined the invasion and spawning risk posed by common carp during an environmental water allocation from the Murray River to the Banrock Wetland in SA in 2008. From his research Rex said there may be some scope to vary the timing of watering to benefit native fish and hinder the invasion and spawning of adult carp. However the benefits of this approach were likely to be short-lived without additional management interventions such as wetland drying. "Another difficulty with this approach is that the effects of altering Environmental Water Allocations timing on wetland ecosystems are limited," he said. 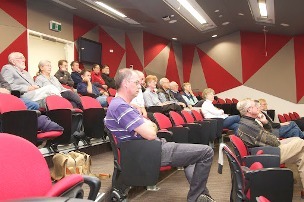 The first of the seminars to be presented at Charles Sturt University as part of the Murray Darling Seminar Series was very well supported with 40 people attending the seminar given by Institute Director Prof Max Finlayson, on Thursday, October 4, 2012. Max's presentation, on 'Climate Change Adaptation for the Murray River' covered a number of areas including how climate change is expected to impact on wetlands along the Murray River; our different responses as we adapt to those impacts (adaptation includes the allocation of environmental water as well as various environmental works and measures designed to spread water across the wetlands, and allow it to drain, and fish to migrate); and a case study on the Coorong and Lakes Alexandrina and Albert at the mouth of the Murray to illustrate some of the quandaries faced. Max emphasised that local communities and local Catchment Management Authorities needed to be more involved in management decisions as they do understand the 'big picture' issues. "Local communities need to be informed, engaged and resourced so they can contribute to the necessary management decisions," says Max. "Other countries are better at doing this than Australia. We do the science well but on many occasions miss out at the community level." After the presentation, people had the opportunity to network and chat while they enjoyed a glass of CSU wine, beer/apple juice from Beechworth with breads and cheeses from Milawa and dips from the King Valley. 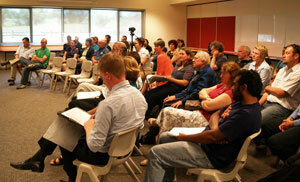 More than 50 people have attended each of the two seminars in this series so far…. a good sign that the series, for the Albury-Wodonga region, is meeting its aims. The collaborative series involves the Murray Darling Freshwater Research Centre, La Trobe University, Charles Sturt University (ILWS), the Murray Catchment Managemeent Authority and the North-East Catchment Management Authority. The seminar's first speaker Ian Burns, Director Environmental Hydrology for Murray-Darling Authority spoke on " Determining environmental water requirements & the environmentally sustainable level of take". The second seminar examined Fish deaths, Azolla and water quality: History and future prospects for the Broken Creek and was delivered by Gavin Rees, a senior scientist with the Murray-Darling Freshwater Research Centre who also suggested some long term prospects for the management of Broken Creek, especially on the back of the 2012 floods. Jeff Curtis Associate Professor, Department of Earth & Environmental Sciences, University of British Columbia, Canada was the speaker at the third seminar and his presentation was on" An introduction to the past, present and future of water science, policy and management for the semi-arid Okanagan Basin, British Columbia." The topic of seminar 4 held on Thursday 6 September 2012 was Mobile Biochar Technology Development and presented by Andrew Briggs Waterways Project Officer, North East Catchment Management Authority. The current practice of burning debris heaps from waterway restoration works is attracting increasing scrutiny from community groups and government institutions due to concerns about greenhouse emissions, fire and occupational health and safety. The NECMA has taken a proactive approach to these issues and commenced a project in partnership with Earth Systems to develop a mobile device to convert woody debris into biochar. The exhibition Marianas Wide held in the NMI Museum of History and Culture, Garapan, Saipan, CNMI from June 13 - August 18, 2012 captured a fleeting moment of Marianas history--a two-week period in early August 2011. The photographs represent people going about their daily lives; at their rancho, at the night-market, at church at work, taking time out to go fishing or just shooting the breeze. Shot on Guam, Saipan and Tinian, these images by ILWS researcher Dr Dirk Spennemann, reveal the diversity and complexity of the Mariana Islands and provide a historic 'snap-shot' of life in the Islands in the early years of the twenty-first century. "As we move through our daily lives, the field of our standard three-dimensional vision covers an angle about 120º. Most cameras can frame only a small fraction of that, thereby disembodying the subject photographed and from its wider environmental setting." says Dirk. To contextualize people in their environment, at work or play, the artist used a vintage 1960s Panon Widelux. These Japanese 35mm film cameras were designed to reproduce a panoramic image covering 120 degrees; the same breadth of vision that the human eye sees. Eight ILWS PhD students and post-doctoratal fellows had the opportunity to take part in a two day "Publishing with Impact" workshop held at the Albury-Wodonga campus, June 14 and 15. The workshop was presented by Dr Camilla Myers from CSIRO Publishing and covered understanding the science publishing culture and why it is important to publish; the skills required to write well structured and easy-to-read scientific articles; how the editorial decision-making and peer-review process works; and the protocols and ethics of scientific publication. Participant PhD student Manu Saunders described the workshop as " truly was the most valuable workshop I have ever attended and I got a great deal of information and resources out of it that I know will help me to develop my career." Read more about her views on the workshop in her blog. Climate change is expected to have major impact on the health of rivers in South Eastern Australia. So far the emphasis, particularly in the Murray Darling Basin, seems to have been on environmental flows as a means of keeping our rivers healthy but what other options are there and are they practical and cost-effective? With this question in mind, about 25 scientific experts, representatives from the three Catchment Management Authorities where the options are to be tested, the Murray Darling Basin Authority, and government agencies attended a workshop hosted by the Institute for Land, Water and Society at the Lake Hume Resort, May 7 to 9. Left to right. 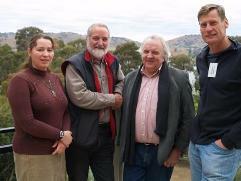 Dr Anna Lukasiewicz, Prof Max Finlayson, Prof Peter Davies (Uni WA) Mr Fin Martin (Lachlan CMA). 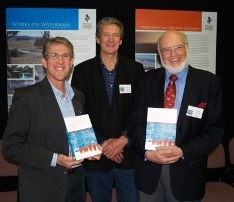 Seventeen invited guests attended the book launched for the new Landscape Logic book on May 2 at the Wodonga offices of the North East Catchment Management Authority. Chair of the Landscape Logic project's Advisory board, Institute adjunct and former commissioner of the NSW Natural Resources Commission, Dr John Williams launched the book and spoke on how this book offers the hope of a better way forward, what we have learnt along the way and the story of the science and the investment in natural resources that will be of use to policy makers and researchers. The ILWS team of social scientists, led by Professor Allan Curtis (also a co-editor of the book), contributed to five chapters to the book. Left to right. 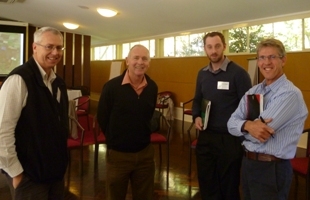 Prof Allan Curtis, Prof Ted Lefroy (UTAS) and Dr John Williams, Institute adjunct. A workshop on Managed Aquifer Recovery (MAR) in Australia, held on April 26 and 27 in Canberra at the Australian National University, was co-convened by ILWS Professor Allan Curtis, together with Professor Tony Jakeman from ANU and Associate Professor Bryce Kelly, University of NSW. The invite-only workshop was intentionally limited to 25 participants who represented the key science disciplines within the NCGRT. Representatives from the Murray Darling Basin Authority, the National Water Commission, the relevant Queensland, NSW and Victorian government departments and the farming industry also attended. The workshop examined the opportunity for MAR in farming landscapes by considering where water might be sourced; the capacity to store water in aquifers; the extent and type of demand for this technology; the environmental benefits, costs and risk associated; and the socio-economic benefits and costs. Dr Andrew Stone, CEO of the non-profit, American Groundwater Association, was the keynote speaker. Participants also listened to and discussed presentations by a range of disciplinary experts before working in smaller groups to explore the opportunity for MAR in specific farming contexts in Queensland and Victoria. About 40 people attended CSU's first public lecture in the 2012 series presented by ILWS Professor Kevin A Parton at the Orange Campus on April 20. His talk on the sustainability of the Murray-Darling Basin and the trade-offs between economic, social and environmental objectives of increased flows of water in the Murray-Darling system (Australia's largest river system) was well received and generated many questions from the audience. During the lecture, Professor Parton detailed arguments for and against the proposed transfer of 2 750 gigalitres per year from irrigation into environmental flows. He considered the costs to irrigation farmers, the amounts of environmental water needed, gains for Murray-Darling communities from the plan, and the effects on the 'losers' from the plan. His preliminary research indicates a number of hypotheses that are worthy of further examination. First, several estimates suggest that the costs to farming will be small as long as irrigation water is purchased at its full market value. Second, there appear to be significant thresholds of environmental water flows which would be required to capture any worthwhile environmental benefits. Third, under various proposed compensation schemes, communities overall in the Murray-Darling Basin may benefit (rather than lose) from transfers of water within the above range. Fourth, there would be some losers from the transfer, especially those dependent on irrigated agriculture who have no irrigation entitlements. This would include local businesses supplying services to irrigated agriculture.